Thirty-five people from all over the Achterhoek gathered out in the countryside. The venue was De Schöppe, a sumptuously converted agricultural building, generously provided by Jonneke Adolfsen and Arjen Haffmans. The reason for this gathering was to partake in a Pub Quiz and the date, the 16 January. Oh, and the other common factor was that all these people were connected in some way or another with St Mary's Chapel and they were all intent on having a wonderful Social Evening. Joyce Wigboldus, ably assisted by Blair Charles, was in charge of organizing the evening. The theme of the Social Evening was a British Pub Quiz, which was where Blair Charles entered the picture. A former team member of the Punch Drunks, the victorious champion team from the Pub Quiz circuit of South West Cumbria, England, he came well qualified to organize a Pub Quiz. Joyce meanwhile led the willing helpers in arranging everything else. People trooping into the building, after oohing and aahing at the beautiful building, delivered a wondrous array of food and refreshments to the catering corner. Catering was strictly on a bring and share basis. Well, not strictly as some people, for various reasons were unable to bring food. They were still invited to share. And so the evening began with a wonderful meal. Our Chaplain, the Revd Alja Tollefsen naturally led us in the Grace. And so the evening began. Joyce organized everyone into teams of four and the members were tasked with inventing team names. A fabulous prize was on offer for the best name. Joyce and Blair appointed themselves as quizmasters because they had set the questions and, therefore, knew all the answers. Marilyn Charles, who had also seen all the answers, acted as scorer. Saturday afternoon March 12th the group “Verkennen + Ontmoeten” (“Explore and Meet”) of the Streekgemeente – De Wijngaard did visit our Chapel. The group is of Protestant origin and is composed of the parishes in Borculo, Geesteren, Gelseaar and Haarlo. In their yearly program they visit neighbouring churches to find out more about the differences in the religious perception. They had requested an introduction in the Anglican church and our Chapel. Simone commenced the information sharing and did explain the Anglican religious basics, how it had started, the way the Anglican Church hierarchy is organized, what the differences are regarding the roman-catholic and the protestant services. She also did tell the storey how the Chapel became the “St. Mary’s Chapel. After some questions from the audience, Lub did explain the historical origin of the Chapel, followed by a detailed architectural tour around the interior and exterior of the building. After about an hour we had some coffee and cake in the Hut. Any questions that had arisen after the presentations and the Chapel tour could be answered as well. We did enjoy hosting the group “Verkennen en Ontmoeten” and hope the visit was useful and could give some insight of our way of worshipping. If any of our visitors is interested in a regular service they are always welcome. Every year a service is held in Apeldoorn to commemorate the martyrs of our time, usually in the last week of Lent or just before. It is a service, which is attended by clergy representatives of the different Christian churches throughout the Netherlands. 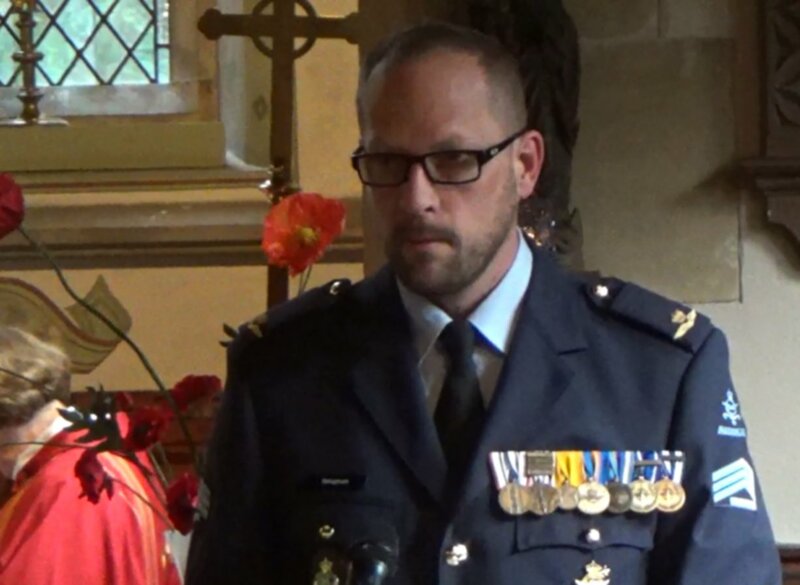 This year the service was led by the Syrian Orthodox bishop and attended by representatives from the Roman Catholic Church, the Protestant Church in the Netherlands, the Old Catholic Church, the Church of England and so on. Although it is a very busy time for most of us, it is a worthwhile and heartwarming occasion. Samen met vluchtelingen de gevallenen van de oorlogen herdenken. Commemmorate together with the refugees the victims of the wars. Voor de zesde keer organiseert de gemeenschap van Sant’Egidio Nederland op 17 maart om 19.00 uur in de Onze Lieve Vrouwekerk te Apeldoorn de jaarlijkse gebedsdienst voor de martelaren. For the sixth time the annual prayer service for the martyrs was held in the Church of Our Lady in Apeldoorn with the community of Sant'Egidio - Netherlands on 17 March at 7 p.m.
Dit keer is de bisschop van de Syrisch Orthodoxe kerk Mor Polycarpus de voorganger, geflankeerd door hoogwaardigheidsbekleders van onder andere de Oud-Katholieke Kerk, Syrisch Katholieke kerk, Russisch-Orthodoxe Kerk, Protestantse Kerk Nederland, de Koptische Kerk, the Church of England en de Katholieke Kerk. This time the bishop of the Syrian Orthodox Church Mor Polycarpus presided, flanked by dignitaries of among others the Oud-Katholieke Church, Syrian Catholic Church, Russian Orthodox Church, the Protestant church of the Netherlands, the Coptic Church, the Church of England and the Catholic Church. Vorig jaar was het een indrukwekkend moment toen vier priesters van de Syrisch-Orthodoxe kerk en een bisschop van de Syrisch-katholieke kerk hun gebed zongen in het Aramees. Ze zongen voor hun overleden broeders en zusters in Syrië en voor hun familie en vrienden die nog wonen in een door de verschrikkelijke oorlog verscheurd land. Het is triest dat in Syrië nog steeds geen verbetering is in de situatie, net als op veel andere plaatsen in de wereld. Last year it was an impressive moment when four priests of the Syrian Orthodox Church and a bishop of the Syrian Catholic church sang their prayer in Aramaic. They sang for their deceased brothers and sisters in Syria and for their family and friends who still live in a terrible war-torn country. It is a sad fact that in Syria is still no improvement in the situation, as in so many other places in the world. Vele vluchtelingen zoeken een nieuwe toekomst van vrede in Europa. De oorlog is met hun komst in ons midden dichtbij gekomen.De mensen in het gebied van de oorlog en de vluchtelingen hier hebben ons gebed hard nodig. Many refugees find a new future of peace in Europe. The people in the area of the war and the refugees here, desperately need our prayes. Tijdens de gebedsdienst worden de namen genoemd van de christenen in alle werelddelen van alle tradities die de afgelopen jaren zijn omgekomen als geloofsgetuigen. We branden kaarsen voor hen en zingen om ontferming in de oude Griekse woorden van het Kyrië Eleison. During the prayer service are the names of the Christians in all parts of the world of all traditions which have died over the last few years as believers are witnessed. We lit candles for them and sang too in the ancient Greek words of the Kyrië Eleison. Het is passend om vlak voor het begin van de Goede Week samen te zijn en na te denken over het lijden in de wereld, een goede opmaat naar Goede Vrijdag en de bevrijding van het Paasfeest. Ook dit jaar hopen wij elkaar als gelovigen te ontmoeten als wij bidden voor vrede en vrijheid van godsdienst in de wereld. Iedereen is van harte uitgenodigd om aan dit gebed deel te nemen. It is appropriate to just before the beginning of the Good Week together to think about the suffering in the world, a good prelude to Good Friday and the liberation of the feast of Easter. Also this year we hope to meet each other as believers if we pray for peace and freedom of religion in the world. Everyone was invited to this prayer to take part. 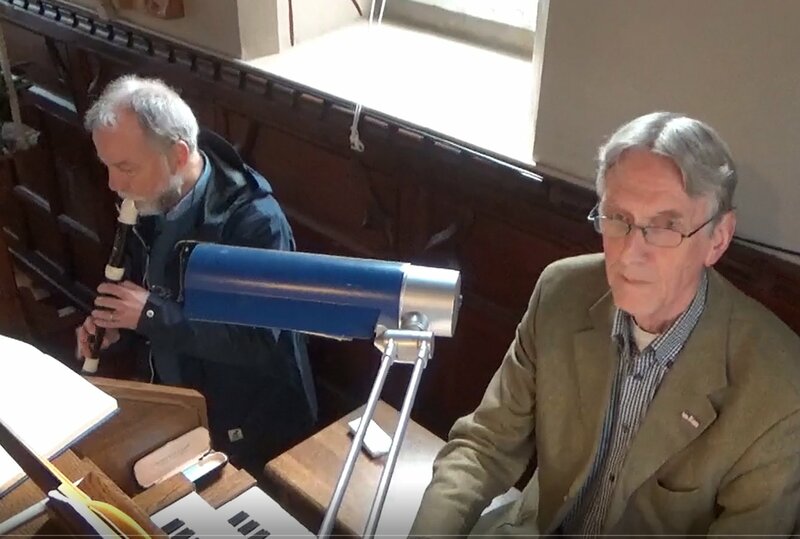 At the end of this year's Easter Service I did catch an excerpt of Louw and Victor playing the Flute and Organ. A glorious day for our yearly Ascension Day Picnic. Our bring and share event after the Ascension Day Service, celebrated by Joop Albers - who stepped in for Alja, she had just returned from a visit to Luweere (Uganda), was blessed with a lot of sunshine and very pleasant temperatures. Everyone had done its best to provide something nice to eat and/or drink. Sharing of food and drinks shows how our community can be great. Carol meanwhile sang wonderful songs while playing her guitars. Alja mentioned in a short speech before saying grace and opening the "buffet" that during her visit in Luweero she felt very welcome and she brought the greetings of the community in Uganda. They would keep us in their prayers and our Western European Community should try to support them in their way forward. Today we did celebrate HM Queen Elizabeth’s 90 Birthday. Both in the Service and in the following reception we did celebrate the 90st Birthday of our supreme Governor HM Queen Elizabeth II. As this is not very often sung in our Chapel, the British National Anthem was a very moving conclusion of today's service. Philippa was the driving power behind the joyful celebrations and everyone did contribute to make the bring and share lunch a splendid function. To add to today's festivities, one of our senior members, Flip Wegenwijs did celebrate his 84th Birthday. In a BBC television address later this day HM Queen Elizabeth II did thank all who took part in today's celebrations. This year's Weldam Castle Fair was blessed with the most beautiful late summer weather. After some light fog when arriving early in the morning, the sun rapidly dissolved the thin fog patches and temperatures were rising fast. Stallholders built up their merchandise and display. Fencers and Archers took posession of the lawn in the westerly garden. Antique British made cars were placed at the circle green at the forecourt. Cakes, scones and rolls were prepared in the Tearoom and everywhere final preparations were made. At the chime of eleven the Highland regiment Pipes and Drums marched out to the gate to welcome the visitors already waiting. The Weldam Castle Fair 2016 had opened. Visitors also did have chance to win a prize, connected to their entry ticket, at the Raffle stall. Quickly the first guests arrived at the Tearoom to have the first choice of the many great cakes and scones prepared by our congregations volunteers. The outside terrace rapidly filled with many visitors who enjoyed their purchase. A "Ascot style hat" competition was held. Ladies (and one gentlemen) with great hats, showing a lot of phantasy were photographed. Katarina, one of the ladies with a custom made hat for this year's Fair did win the competion. The Fair concluded with a short "Songs of Praise" session in front of the Tearoom. Also a traditional Evensong service was held in the Weldam Chapel. The Castle Fair committee would like to thank Count Alfred and Countess Christine for their hospitality at the Weldam Estate, all volunteers who made it possible and foremost all our visitors who came in great numbers and made this year's Fair to a success. Today we did celebrate this years Harvest Festival. Harvest Festival is a celebration of the food grown on the land. Thanksgiving ceremonies and celebrations for a successful harvest are both worldwide and very ancient. In Britain, we have given thanks for successful harvests since pagan times. We celebrate this day by singing, praying and decorating our churches with baskets of fruit and food in a festival known as 'Harvest Festival'. Harvest Festival reminds Christians of all the good things God gives them. This makes them want to share with others who are not so fortunate. In Churches, people bring food from home to a Harvest Festival Service. In our congregation the harvest goods have been donated to the Voedselbank in Goor. At the end of the service a representative of the Goor voedselbank did give a short brief on the purpose and way of work. He did thank us for all the donations that he may relay to people in need. After the service we gathered for a "bring and share meal". This was quite a success andfor everyone did their best to make their cooking / food preparing skills. Today we did celebrate this memorial day observed in Commonwealth countries since the end of World War I to remember the members of their armed forces who have died in the line of duty. This day, or alternative dates, are also recognized as special days for war remembrances in many non-Commonwealth countries. The video below may give an impression of this celebration. On the 13th of December our Chapel was again the scene of the traditional Lessons and Carols service. The ladies of the flower guild had again done their utmost to provide the congregation with beautiful floral arrangements. Also were some special flower arrangements on the altar. These were be taken to some of our elderly, housebound or sick members after the service. The traditional readings, alternating with Carols were held. After the service a fellowship get together with members of the congregation and guests as far as Drachten in Friesland that came especially for this event, was organized outside the Hut. Hot coffee and tea, mulled wine and Christmas cakes were served. Like every year this was very much appreciated by everyone present.